Polished Concrete - Liquid Stone Inc. 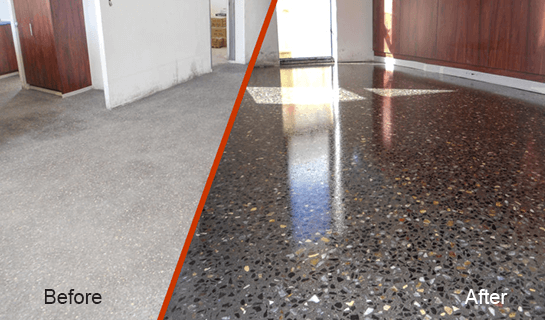 Whether installing a new concrete floor or polishing your existing concrete floor, we provide professional results guaranteed to meet the highest standards. With more than 40 combined years of experience grinding and polishing concrete floors, our experience and equipment will reveal the hidden beauty of your concrete floor. We take the necessary steps to ensure a flawless, long-lasting finish. Concrete polishing creates a durable long-lasting finish, so you’ll save in the long-term on maintenance costs. Unlike carpet, which needs to be cleaned every six months, or hardwood, which is expensive to refinish, concrete floors can be affordably re-polished every 3-5 years. Polished concrete floors make the economical sense for schools, sports facilities, hospitals, stores and warehouses with heavy foot traffic. Concrete polishing adds shine to the flooring surface, increasing the amount of ambient light the floor reflects. Polished areas will appear brighter and much more open. Polished concrete floors are nonslip and abrasive resistant – perfect for areas with heavy foot traffic or where material-handling equipment is operated. Compared to carpet and tile grout – which can retain dust mites and mold – concrete polished floors are a much more hygienic surface. They can be easily cleaned and disinfected without risk of damage.